Produktinformationen "Dedicated Pack V2 50 Packs - AM/PM Split Formel 25 Servings"
DEDICATED PACK™ is the ultimate, most complete, smartest and highest dosed training pack on the planet. DEDICATED PACK™ is actually 7 products rolled into one, containing a separate formula for day and night giving you what you need, when you need it. Supporting any athlete’s needs from within and from all possible angles, there is no more need to supplement with various other products, DEDICATED PACK™ takes care of it all. DEDICATED PACK™ has got you covered, day and night. Vitamins & minerals are not only needed for optimal health, they are essential for anyone looking to build muscle, lose fat, increase performance and overall health. By adding a complete range of other nutrients to DEDICATED PACK™ its health increasing and performance enhancing effects are more than doubled. 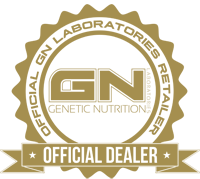 DEDICATED PACK™ was designed with the serious intelligent athlete in mind and only contains ingredients that work synergistically together. The problem with most nutrients, vitamins and minerals is that they should never be taken at the same time or absorption will be hindered or halted. In fact, several minerals will even effectively block protein absorption! DEDICATED PACK™ is the first performance pack that is more than a simple mix of cheap ingredients thrown together. Every ingredient, every dosage, every unique form and timing has a meaning. Finally a Pack that does it right! Every ingredient and dosage in DEDICATED PACK™ has a clinically researched proven benefit. DEDICATED PACK™ contains only research proven and patented forms of each mineral and vitamin for maximum effectiveness. Optimal dosage is important, but maximal absorption is king! DEDICATED PACK™ contains 50 packs with easy to swallow various capsules, softgels and tablets. Containing no fillers, underdosed ingredients, stimulants or other junk. 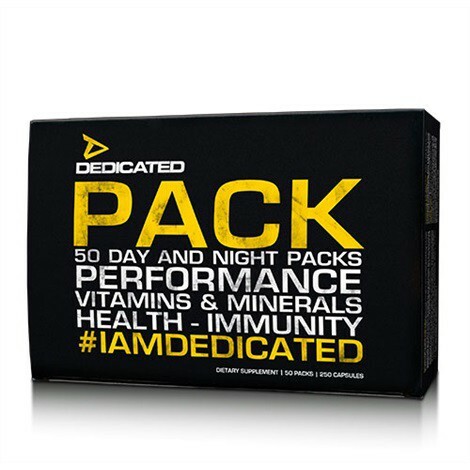 DEDICATED PACK™ is to be used every day of the week at the right time of day for increased performance and health. A healthy body is a strong and optimal performing body. OTHER INGREDIENTS: Dicalcium Phosphate, Microcrystalline Cellulose, Croscarmellose Sodium, Stearic Acid, Magnesium Stearate, Silicon Dioxide, Pharmaceutical Glaze, Talc, Gelatin, Rice Flour, FD&C Blue#1, FD&C Red#40, Norwegian Fish Oil, D-Alpha Tocopherol, Natural Citrus Flavoured Gelatin (Gelatin, Glycerin, Water), Soybean Oil, Vegetable Glycerin, Corn Oil, Purified Water. OTHER INGREDIENTS: Gelatin, Rice Flour, Magnesium Stearate, Dicalcium Phosphate, Microcrystalline Cellulose, Croscarmellose Sodium, Stearic Acid, Silicon Dioxide, Pharmaceutical Glaze and Talc. ALLERGY ALERT: Contains soy, wheat, gluten and fish (anchovy, sardine and mackerel). Keep out of reach of children. Not to be used by individuals under the age of 18 due to the potent dosage. Containing only the best bio-available and highest clinically researched dose of each patented vitamin and (chelated) mineral. This complex is further enhanced with the best bio-available forms of B vitamins. For increased protein and energy utilization each B vitamin has been added at a massive 100mg dosage. Made from pure fish oil from the pristine waters of Norway with a potent dose of EPA and DHA for overall health, joint lubrication, muscle building and fat burning. Vitamin D is an extremely important vitamin for athletes as it is directly linked to natural hormonal stimulation and overall well-being. Only by encasing Vitamin D in an oil based softgel can optimal absorption be guaranteed. Over 77% of the general population is considered to be Vitamin D deficient. As such, supplementing with Vitamin D usually has an immediate impact on athletic performance and wellbeing. Perhaps the most potent and important of all vitamins due to its crucial role in overall health, recovery, tissue repair and performance. However when taken in too high dosages vitamin C can actually hinder muscle growth through its anti-oxidant usage. DEDICATED PACK™ contains the right amount of Vitamin C; not too much, but certainly not too little. This rather unique herb has been used for thousands of years for increased health and a strong immune system. Echinacea has a proven usage against common colds and infections, nothing hinders performance and results more when you are not being able to function at peak levels. This unique plant has also been used for thousands of years for increased ATP production and its potent adaptogenic qualities. Adaptogenic means that Rhodiola can provide the body with what it needs. If you are anxious, it will calm you down and if you are tired it will provide clean energy. Is added to truly supercharge DEDICATED PACK™. Astragin™ is a truly revolutionary absorption enhancer and nutrient repartitioner. Capable of increasing absorption of not only the ingredients in DEDICATED PACK™ with an astonishing 67%, but basically all food and supplement intake. Most multivitamins have extremely poor bio-availability as various minerals interact with each other. Astragin™ cancels this poor absorption and causes results that can be felt within days. Although the name sounds quite corny, its usage certainly isn’t! Super Grape™ is our unique grape seed extract that’s exclusively developed to be structurally unique, yielding unprecedented levels of low molecular weight polyphenols and epicatechin. This means that Super Grape™ has a very profound effect on increasing blood flow to working muscles through relaxation of the blood vessels. Increasing blood flow to working muscles will allow for increased delivery of nutrients and thus enhancing strength, speeding up recovery and being very heart healthy! Has been added as well to ensure optimal absorption of all nutrients from DEDICATED PACK™. Bioperine™ is a patented black pepper extract that has a clinical proven effectiveness. Containing the most bio-available forms of Zinc and Magnesium in the chelate form. Vitamin B6 is typically added for enhanced absorption. However regular B6 is typically used in its completely useless form of pyridoxine which cannot be absorbed by the human body. DEDICATED PACK™ contains a massive dose of the only bio-available form of B6; Pyridoxale-5-Phosphate. A difference you can truly feel. By taking this complex before bed time, protein utilization is not hindered as when taken during the day and sleep quality will be increased. Weiterführende Links zu "Dedicated Pack V2 50 Packs - AM/PM Split Formel 25 Servings"
Kundenbewertungen für "Dedicated Pack V2 50 Packs - AM/PM Split Formel 25 Servings"